This is the third in this blog post series, looking at how innovations in power distribution are helping facility teams like yours take full advantage of trends in energy decarbonization, decentralization, and digitization. You can now better meet efficiency and sustainability goals without sacrificing power reliability, safety, or productivity. In this post, we’ll look specifically at advances in connectivity. As mentioned in the last post, digitization is enabling real-time and historical data to be extracted from a variety of smart meters, circuit breakers, and other equipment. Connecting devices to a communication network gives operations and maintenance teams an immediate view of energy consumption and power conditions from wherever they are. A laptop, phone, or tablet is all that’s needed to reach from service entrances to the ‘edge’ of the facility or campus power infrastructure. For example, if a breaker trips in a hospital, the facility manager can immediately see where it is and why it tripped. The dispatched electrician will be more likely to fix the equipment in one trip. The facility manager can also reset the breaker from his/her office after loads have been safely redistributed to other breakers. Many communication options are available, including multiple connections between a device and different upstream systems, parallel links for added resilience, and gateways that collect and route data. One of the newest trends is combining smart devices and gateways to create smart panels. Data can often be directly accessed from a single device or gateway using a common browser, but data from across all points in a network is typically uploaded to a cloud-based repository. So how do you choose the most appropriate devices and connections for your power network? It depends on the functionality required at each point. For example, if you need to sub-meter energy consumption for many loads, the IoT Institute recommends the new generation of IP-enabled wireless energy meters to help reduce cabling requirements. Where more intensive power analysis and control are needed, a multi-function device would likely use a fast Ethernet connection. Common communication protocols, standardized device specifications, modularized components, and ‘plug-in’ connectivity are all making power system design simpler and panel configuration and customization faster. Open network extensibility is also enabling the integration of all of your energy assets. This includes distributed energy resources like solar panels, energy storage, electric vehicle charging stations, and combined-heat-and-power systems. With careful monitoring and control, these can be optimized to operate at peak efficiency and deliver the maximum ROI. To extract the full value, smart devices and energy assets need to be connected to upstream software. Many solutions are now cloud-hosted, enabling simpler information sharing and collaboration between facility teams, contractors, and other service providers. PC and mobile access ensures fast response to equipment alarms. Data from across the infrastructure is continuously uploaded and aggregated. Some applications track equipment and maintenance activity, while others go further by transforming energy and operations data into advanced reports. These offer insights that can be acted on directly by the facility team, or support consultation with an expert service provider. For example, reports based on data from connected smart panels and MV switchgear can help improve asset management by predicting when equipment maintenance may be needed. They can also indicate when electrical loads need to be redistributed or rebalanced to help prevent overloads and downtime. There are also applications that can help you take advantage of the smart grid. These integrate real-time operational data from business processes and DER assets, as well as weather prediction and energy pricing. From these inputs, the app simplifies participation in programs such as demand response, as well as helping you optimize the use of onsite energy production. As a next step, integrating power management and building management systems (BMS) can further catalyze collaboration between facility teams. In some cases, power management capabilities can be embedded directly into a BMS platform. This unified operational view helps put comfort and energy efficiency in proper, balanced context. With these new connections, cyber security has become a growing concern. Whatever power distribution solution or components you choose, be careful to ensure that the supplier(s) adhere to security regulations and best practices, execute extensive testing, and provide responsive support. 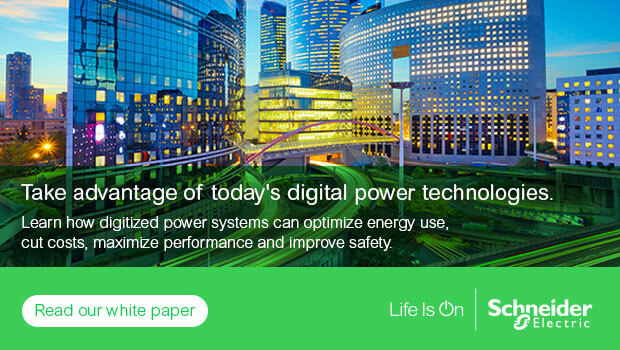 Schneider Electric is a leader in intelligent power distribution solutions, offering a wide range of smart devices and connectivity options, including our PowerTag wireless metering units for circuit breakers. Cloud-hosted apps include the EcoStruxure™ Facility Expert (formerly Facility Hero) smartphone-ready digital logbook and the EcoStruxure Facility Advisor (formerly Facility Insights) suite of managed services. For all solutions and products, Schneider Electric follows a strict, disciplined approach to cyber security. For example, the connected products from the Easergy range fully comply with the IEC 61351 standard. In the next post in this series, we’ll look at how new analytic tools help proactively optimize efficiency, sustainability, and reliability.